We will be happy to resolve any issues you may have in a cordial and friendly manner. Otherwise deal is final. All products are quality checked. Mini Electric Guitar 1. Plastic Support 1. You may also like. 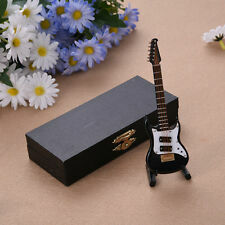 Item: Wooden Guitar Miniature Dollhouse. 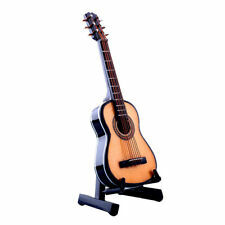 Wooden Guitar is miniature replicas and perfect for the music lover. Specification: 1:12 Scale Miniature. If you haven't received item. Lovely florets in vase -ideal trinket for living room, bathroom accessories or curtains. We will be happy to resolve any issues you may have in a cordial and friendly manner. Material: iron. Weight: about 360g. Limoges Dollhouse Furniture . Piano is Signed Limoges as shown in photo. BEAUTIFUL COLORS AND DETAIL. Divan and Spectacular Table with scene. Please view photos as they are intended to be part of description. Nice condition. VITRA DESIGN MUSEUM. LC4 LE CORBUSIER LOUNGE CHAIR. 1/6 SCALE MINIATURE. LIMITED & SOLD OUT. COLLECTIBLES & ANTIQUE TOYS ! This desk is crafted of burl walnut with incised dentil detail on the front and sides. It is topped with a decorative circle cut gallery and has the original bun feet. The slant top opens to reveal two slanted drawers with blue paper lining. Quantity : 2 Goldfish. Material : Ceramic. Condition : New. YOU GET EVERYTHING IN THE PICTURE. No signature visible. We are not sure what the material is the portrait is painted on, appears to be heavy cardboard. There is a ring on top to hang the portrait. No condition issues were observed on the portrait. 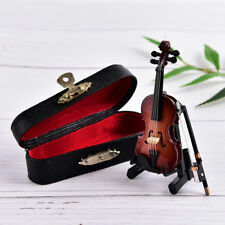 1 x Violin Miniature. Notice: This miniature replica look great but is not playable. 1 x Case(other accessories demo in the picture is not included.). Color:As picture shown. Due to the difference between different monitors, the picture may not reflect the actual color of the item. Vintage miniature QUIMPER serving pieces plus 2 Provence SANTON figures - READ!! There are 14 pieces of Quimper pottery. The largest plate is 5". All are in excellent condition and the French terracotta Santons are 8" tall and signed "M.H.". They are also in excellent condition.